Last Wednesday, I attended probably one of the cutest events I’ve ever been to. 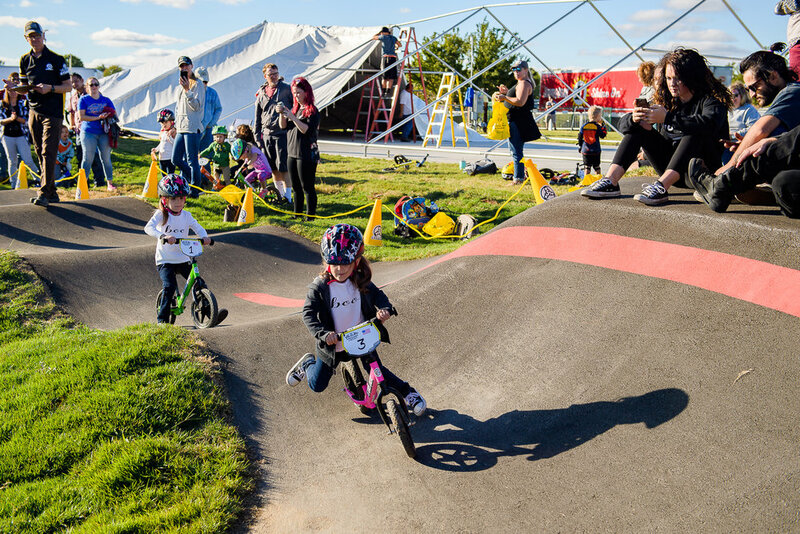 It was held at the new Runway Bike Park, a new biking attraction built in Northwest Arkansas and is roughly 15 minutes away from our house. It is so cool, and I know that I’m going to be spending a lot of time over there in the days to come. 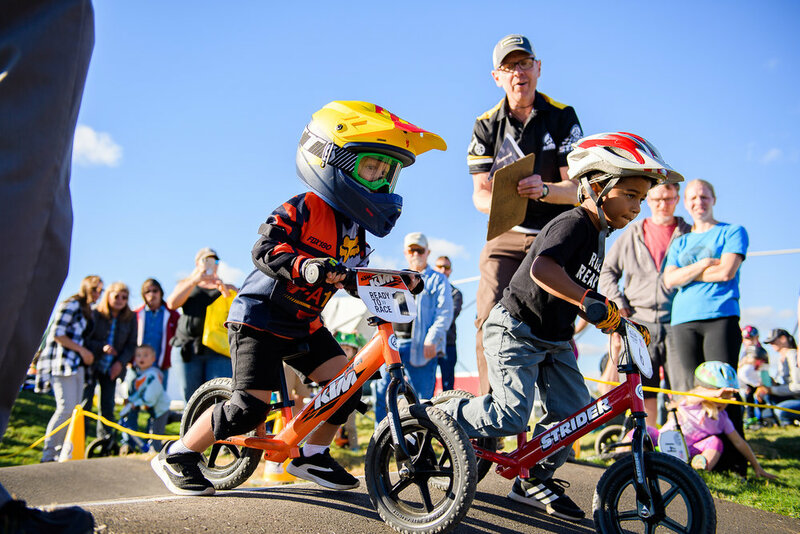 To help kick off the grand opening, the park had a kids race where kids aged from 3 - 6 could bring their strider bikes and helmets and christen the new track before the Big Boys took over later that weekend (more to come about that event in a later post). It was a beautiful day, just a touch cool and with a light breeze. The sun was low in the sky, the light was beautiful and the kids, oh my goodness, they were the very definition of cuteness. 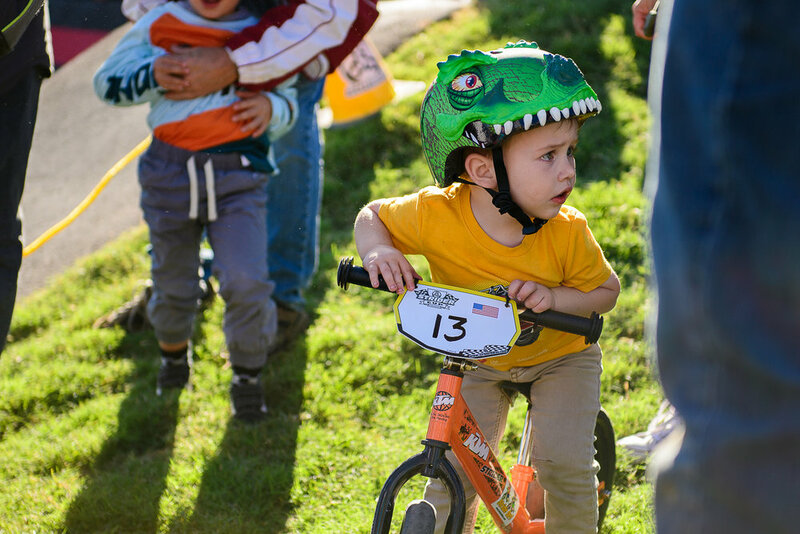 Some were dressed in regular street clothes while others were completely decked out in full bike racing gear; some had regular helmets, others sported dinosaurs and super heroes perched on top of their heads. All of them had grins from ear to ear and all of them were having a blast. It was just too much to take, a true adorableness overload. The other day, I emailed a friend of mine about a recall that Nikon had put out that concerned our cameras. She wrote back, thanking me, and at the end of her email, she mentioned " . . . you have settled into a great place, a very creative space where you really listen to your heart and it shows in your work." I was touched by her words, and feel that yes, I have settled into a great place with my photography. I've been trying new things and slowly but surely overcoming my fear of "But-what-if-they-laugh-at-me-or-say-no?" I'm feeling more and more comfortable in my skin and in calling myself a Photographer. 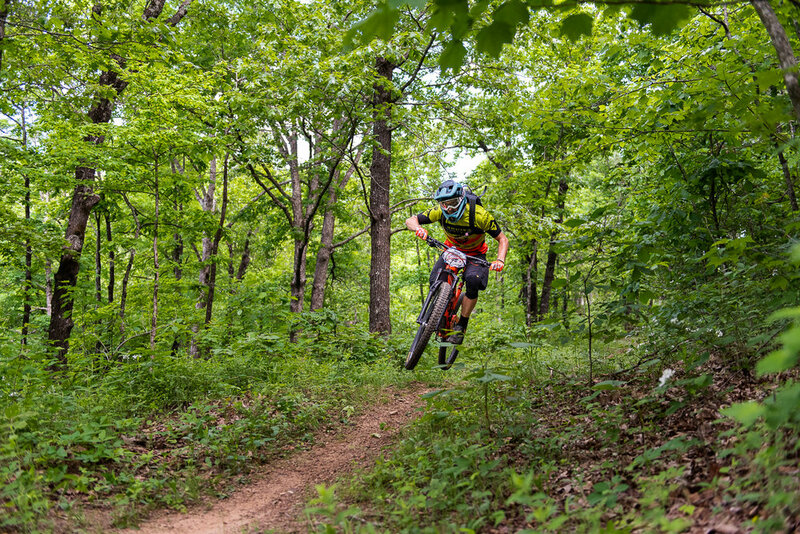 And I never felt more comfortable or at home with myself than last Sunday shooting the latest race put on by the Arkansas Enduro Series out along the Back 40 Trail system, about an hour's drive north of Fayetteville. The weather was beautiful, the early morning sunlight glinting off cobwebs lining the dirt trails and glancing off the handlebars of the riders as they flew by David and myself. 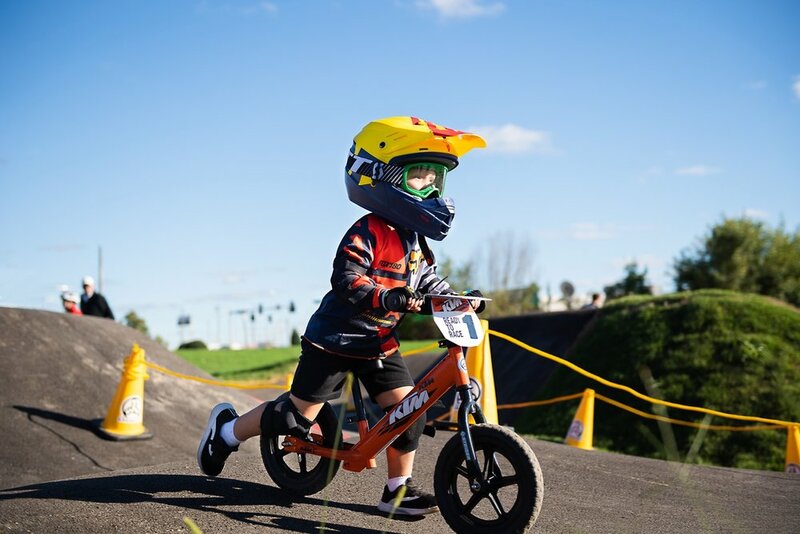 There were plenty of whoops and hollers echoing through the little valleys as the racers jumped their bikes off of drops, as well as plenty of "oh, s***!" when unprepared racers came up on unexpected obstacles in the trail. There were crashes as well. 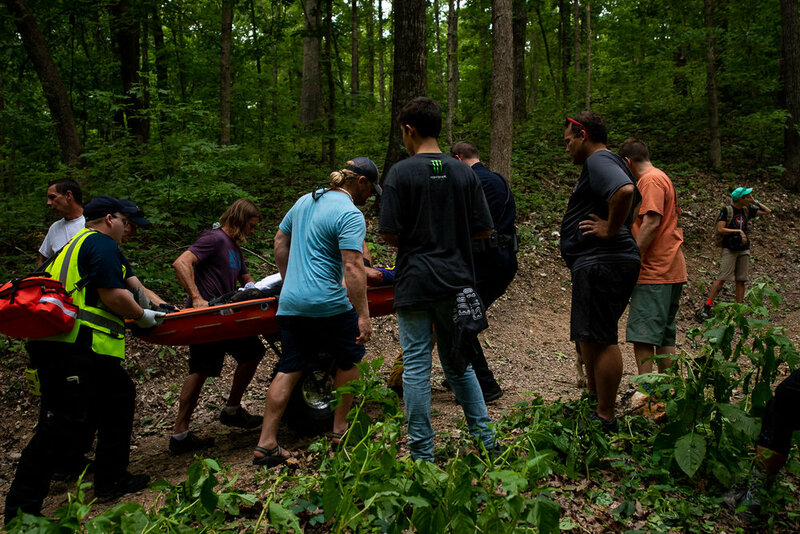 I heard one rider yell from a small ravine after his bike wheels skidded off course and he went tumbling, "I'm okay! I've still got all my teeth!". There were less fortunate riders, however, that needed to be carried out on stretchers suffering from mild concussions and other injuries. 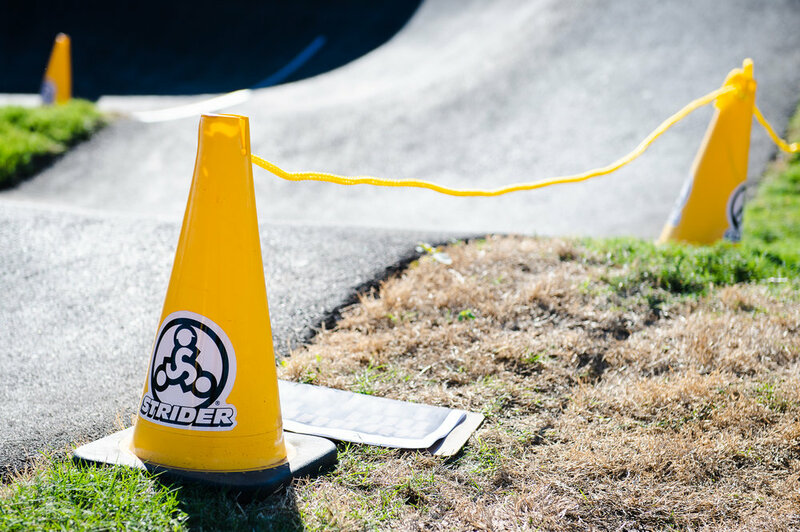 Seeing the first serious injured racer being carried off really drove home the fact that bike helmets can save your life. I just wish more people understood how important they are. 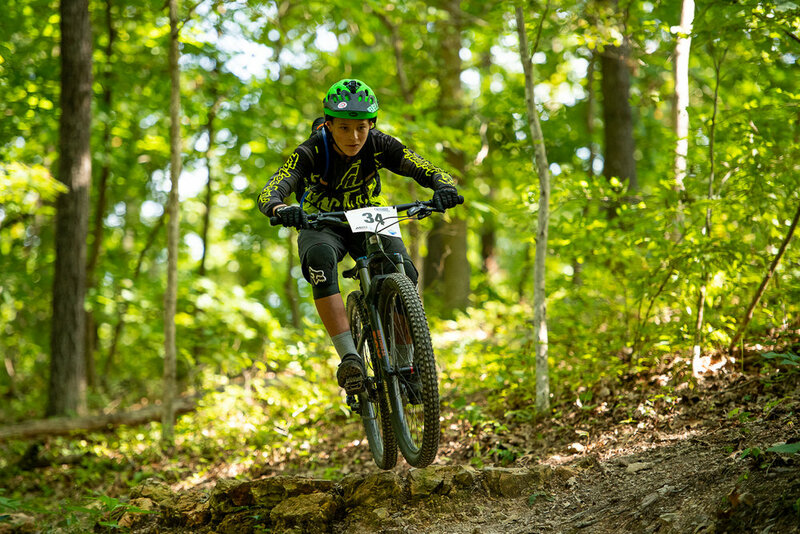 The next Enduro race is August 18-19, and I'm sure it will be as thrilling and exhausting and hot and dirty and as fun as this race was. For more race pictures that David and I took, please click on this link: "Bella Vista Enduro-July 2018". I realize that I go through very specific spells as a photographer. I think we all do, all of us that photograph, that write, that draw, that create. When I first picked up my camera in late 2010, I shot landscapes, nature and macro, never even entertaining the idea of taking pictures of people, of girls making baskets on the court or boys making touchdowns on the field. 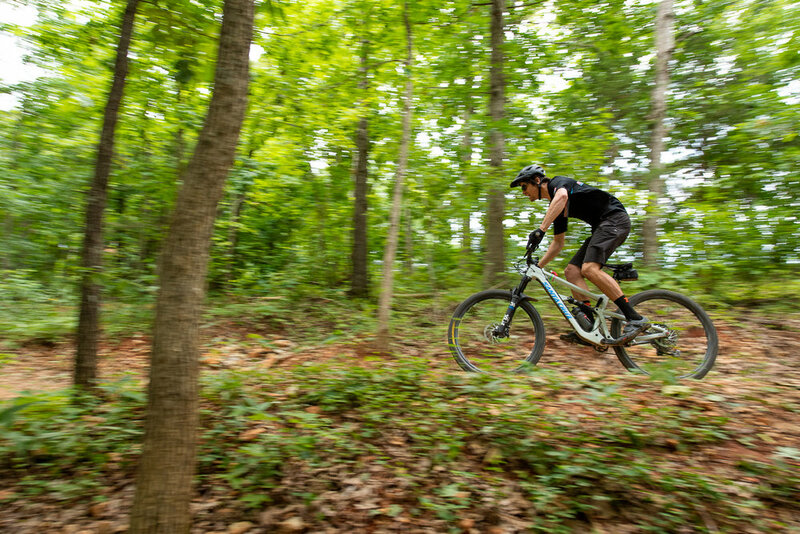 I never thought about hunkering down in weeds (and possibly poison ivy) along a single track of dirt hidden away in the woods in the middle of Red Star, Arkansas and taking pictures of mountain bikers barreling down on me, twisting their bike frames in mid air to make an epic leap over small hills even more epic. I never imagined thinking that food could be made beautiful, of all the hours spent getting the props right, arranging linens just so, of how detailed a photograph of milk and cookies could become. I also never imagined ever, ever shooting with artificial light, of going down that rabbit hole and finding out how fascinating off camera flash could be. When I began learning about photography, I was happy taking pictures of sunsets and ladybugs, creeks and cows. But sunsets fade, ladybugs fly away, creeks dry up and cows move to different pastures and I moved on, discovering what a thrill it was to shoot junior high football, traveling girls basketball teams, high school softball and baseball. And then I fell completely head over heels in love with photographing outdoor adventure sports. I got to get dirty, listen to the birds singing high above me in the tree branches and watch spiders spin their webs. Watching mountain bikers tearing it up on the trails, seeing the pure joy (okay, and a little bit of sheer terror) on their faces as they whizzed by me, some shouting profanely if their chains had popped off during the descent, others wearing big grins, made me feel so in the moment, happy that I caught them with my camera. And if I was out on the water kayaking or stand up paddle boarding with David and Joe, I got to get wet and play in the river. I basked in the wonderful isolation of just being. But then winter and cold weather hit and I was driven indoors to figure out what else I could do while waiting for warm weather to return. That was when I hit upon food photography. I photographed food every day of the week for months. It was frustrating, exhilarating, tiring, but oh, so worth it when the picture in my head appeared on my computer screen afterwards. I discovered the thrill of thrifting, spending hours (and, ahem, quite a bit of money) mulling over teapots, creamers, spoons and rolling pins. I watched classes and read books, all trying to better myself at this new calling I had found. I thought I had finally settled on what it was I was meant to be photographing. Once again, I have proven myself wrong. Food can be pretty, but let's admit it, it can be a little boring and predictable. My love of sports and off camera flash fascination never left me over the winter, and I found myself eager to get back to the trails, the water and the basketball courts. This past weekend, I cleaned out my food props closet, keeping just a handful of useful items I can use if I found myself shooting food in the future, gathered up all but two of my surfaces and donated everything to Goodwill Monday morning. I have to say, it felt very cleansing to do so. Something else I realized about myself while taking this journey is I need challenges in my creative life, scenarios that makes me think and figure out a situation. 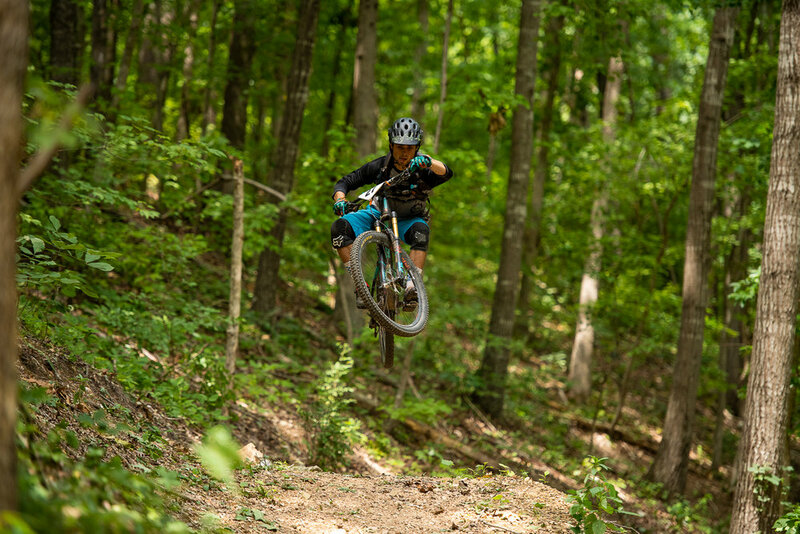 The rush I get when I can stop a mountain biker mid-air with just my camera is indescribable. I get giddy when I pan a road biker , showing just how fast she's moving with that same camera. Those feelings just don't pertain to sports, either. I get the same excitement when I'm taking portraits of people, especially taking portraits and headshots. It's nerve wracking for me to ask someone to turn their head this way, their shoulders that way and then look at the camera. I'm not good with giving direction, but again, the challenge lies in swallowing down that fear in my throat to get the image that I want so badly. I'm getting used to being brave, I think. I love shooting sports. I feel at home out in the woods and excited on the sidelines. I love the silence of the trees and the roar of the crowds. I marvel at what humans can do with their bodies, stuff that I could only hope to do in my dreams. The urge to cover sports, both conventional and not-so-conventional, never left me during the months when I shot food or nature or macro. I get happy when I see a team converge on a player, high five-ing them if they made a touchdown or scored the winning basket. 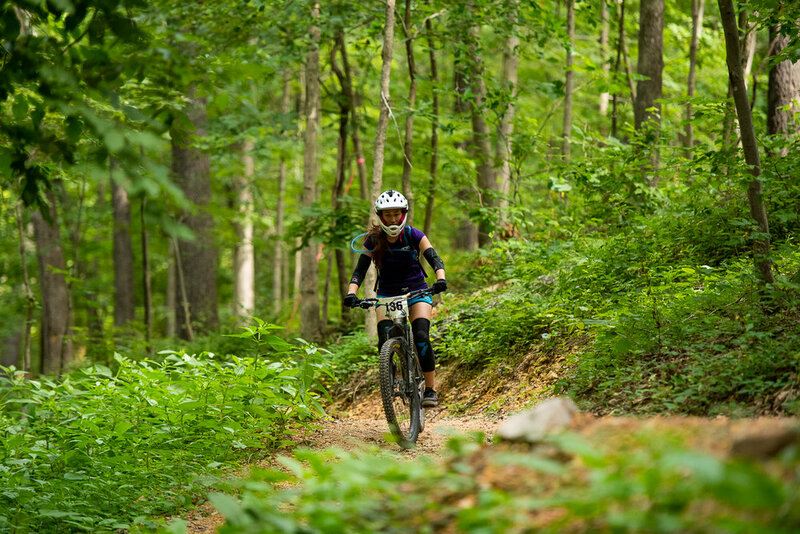 I grin when I'm around a group of mountain bikers and get to overhear their banter, all eager to start their downhill descent along a narrow dirt trail, all of them giving each other a hard time, but all of them a team in their own right. Maybe it's because I was never on a team due to childhood asthma, but I feel a bit like an outsider looking in, as well as a welcomed member of the group when I have my camera to my eye. Either way, I truly have found my calling and I'm eager to get going once again. You may have noticed that I have changed my blog name back to "Kate Austin Photography". I did that to keep my website, my blog, and my social media accounts all uniform. I'm putting out feelers for more portrait/headshot work (because people are fascinating, too) and I hope to branch out in that area, thus the change in branding. 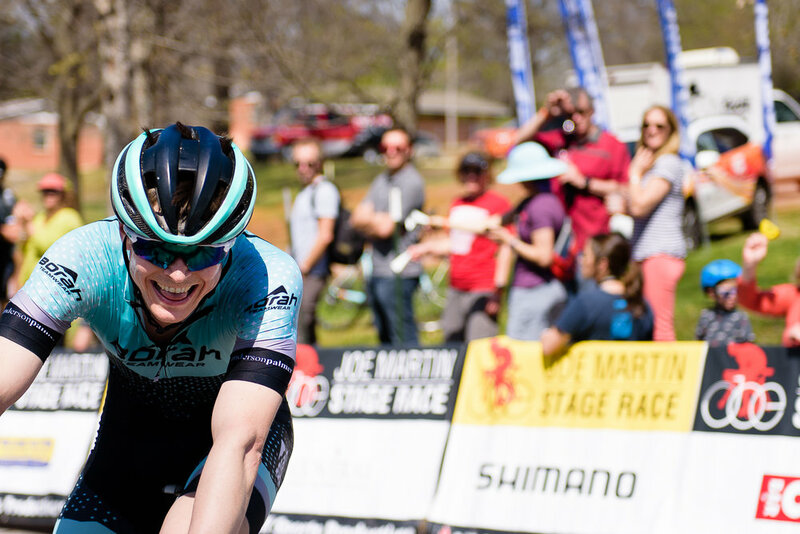 Every April, the Joe Martin Stage Race rolls into Fayetteville, bringing with it close to 1,000 cyclists and team support from all over the States and the world. 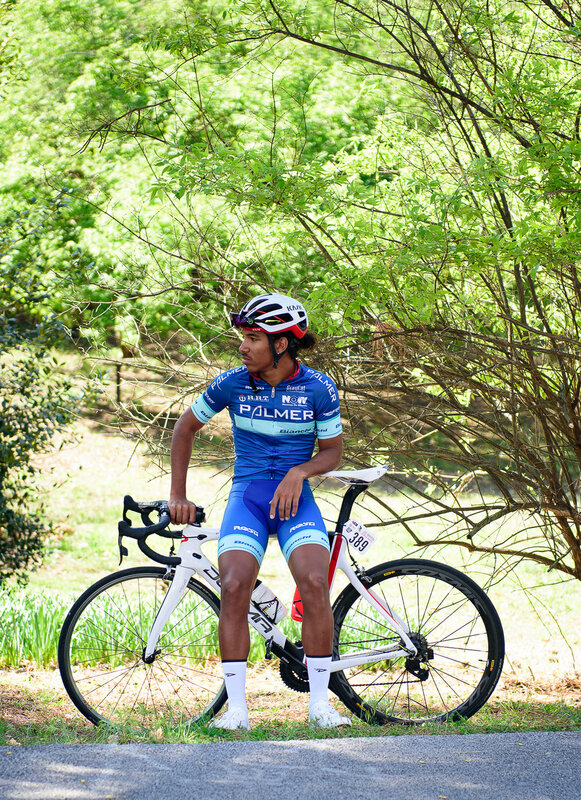 For four days, top cyclists battle it out for points and claims to fame and for pride in themselves for finishing one of the most grueling qualifiers for the Tour de France. 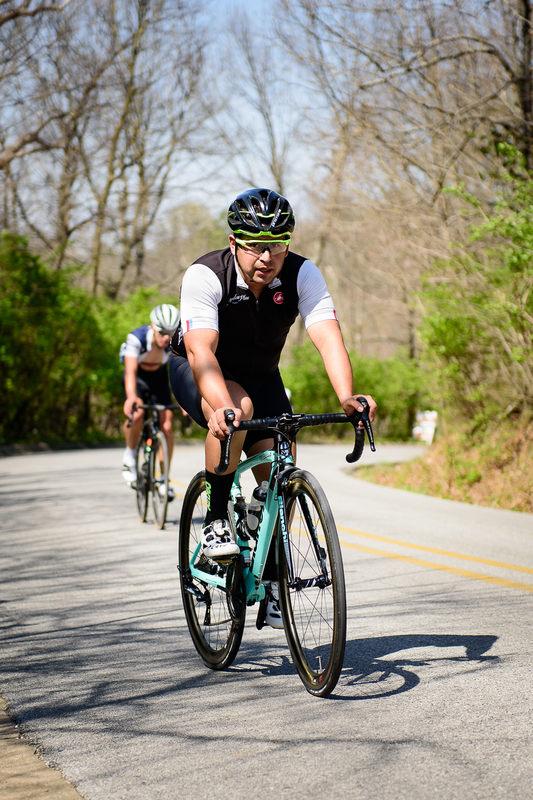 This year, the race began on Thursday, a gorgeous WARM day, but with some seriously strong headwinds blowing out of the south. 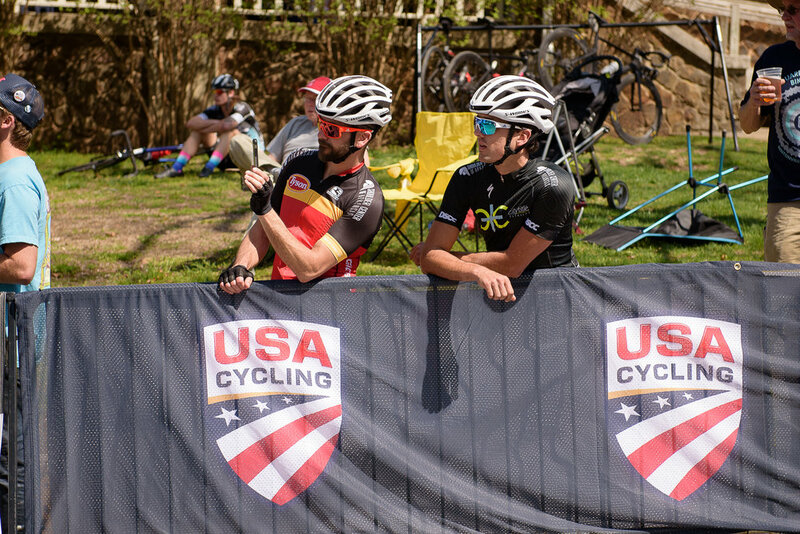 Also, for something new and "fun", the race directors had the first leg of the race (a mere 113-miler for the elite amateur men) finish uphill on top of Mt. Sequoyah, a local landmark here in town and sporting some wicked twists and turns as you head up the drive. 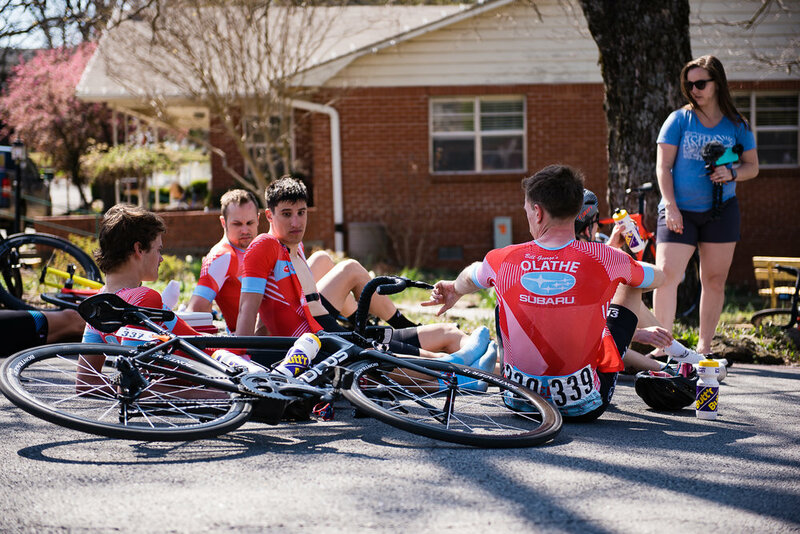 What is is it with race directors in NW Arkansas placing finish lines at the top of a hill? It isn't just bike race directors either, running races have the same placement for finish lines, too! Thursday, I took a shuttle up to the top of Mt. Sequoyah to shoot some of the race for myself, which is a real treat. I don't have to shoot every racer if I don't want to, I can shoot how and what I want, I can be creative and and play with composition. And I can leave whenever I want to, also. I enjoy doing that every now and then, helps to loosen up the juices and get them flowing again. 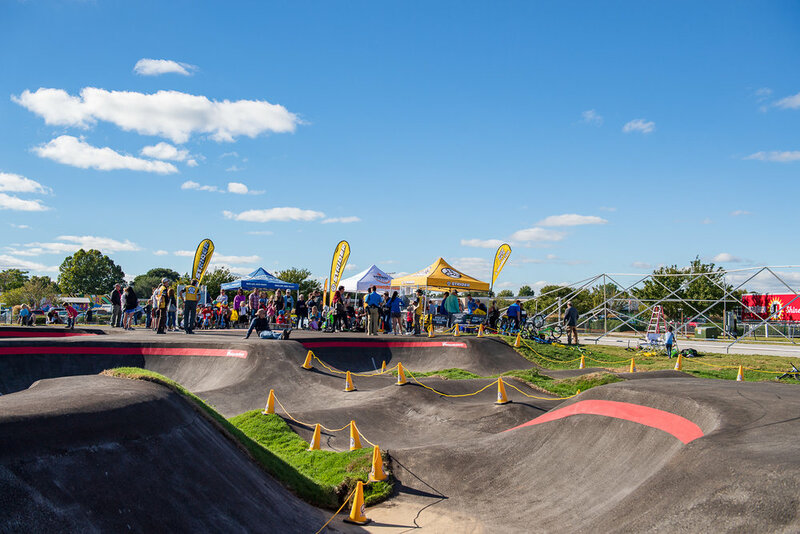 Due to the heavy winds, the finish was delayed by an hour, with the elite amateur men arriving an hour later than was expected, the pro women arriving an hour later than they were expected and the pro men, likewise. Nothing like riding headfirst into gusty spring winds to make you late. I stayed for a couple hours, shooting over 500 photos, until my shuttle showed up to take me back to my car. I had a blast, even getting a small sunburn from the strong sun beating down on all the asphalt that covered the events' parking lot. 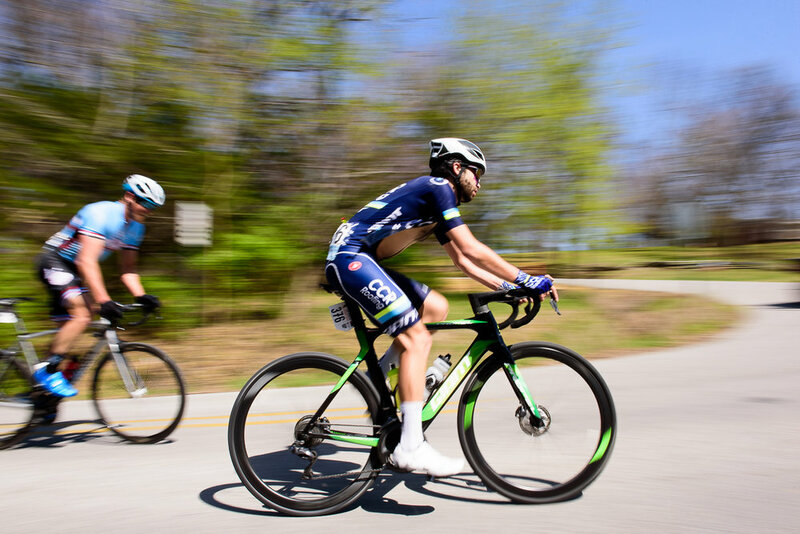 The race finished up the final stage this afternoon, and now Fayetteville will quiet down until the next event comes along. Quiet down and catch her breath. 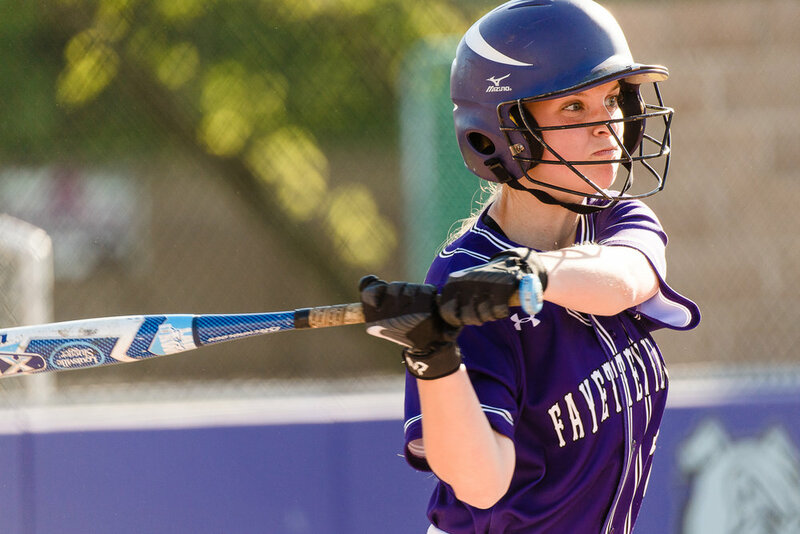 I photographed the Lady Dawgs softball team of Fayetteville High school last week as they took on Rogers Heritage, a high school from a neighboring town. The time was late in the day, around 5:00 in the afternoon, and the sunlight streaming down from the clear blue sky cast long shadows along the ball field. It's that late-in-the-day time that makes these games so relaxing to shoot. There's a laziness and a peacefulness to this sport that you really just can't find during a basketball game or a football game. There's time to catch your breath and relax and really watch the game and the spectators in the stands. 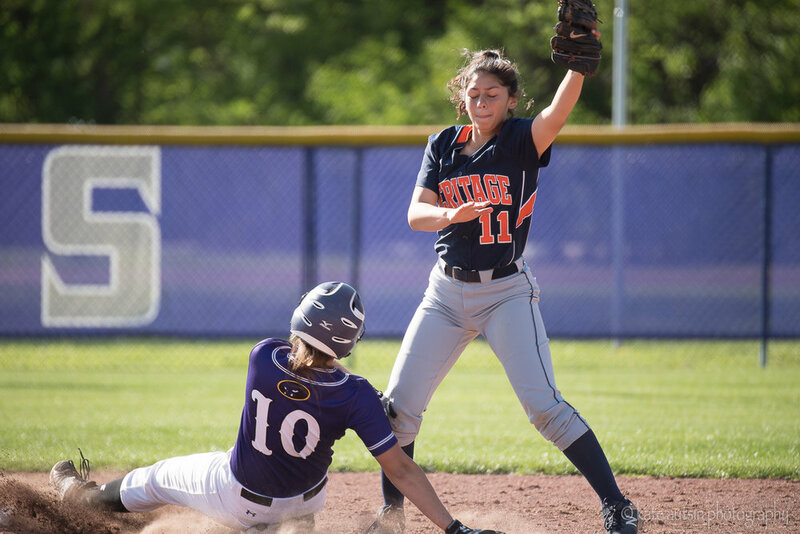 There's a slowness to the sport, not all the time, but in between the batters and the innings, you can watch as the umpire dusts off home plate, the girls out in the infield throwing balls to one another, you can listen to the chatter in the dugout. There are the little children running around in the grassy field behind you playing their own made up games as the voices of the adults float softly over to you in the breezes. The raucousness of the crowds at the more popular sports, the fans and marching bands of Friday night football games and basketball games, is toned down to a more tolerable level of cheering when base hits and home runs are made. 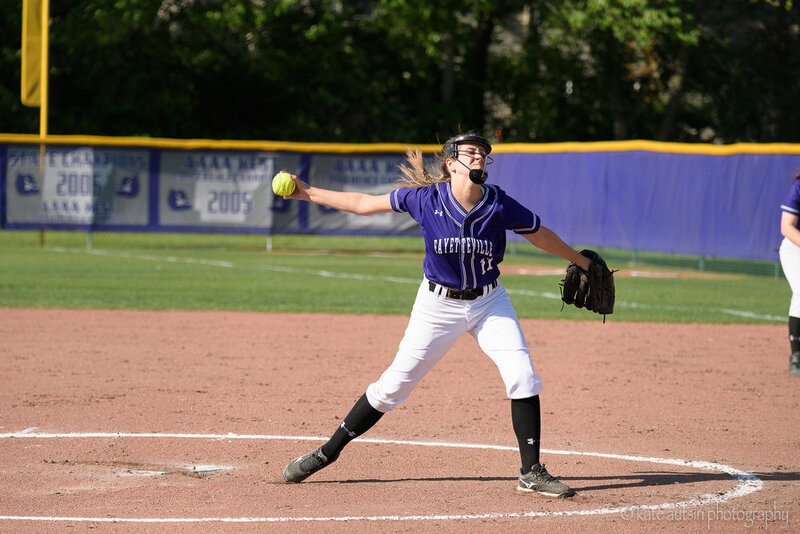 The pitchers fascinate me during softball games. It's as though their arms are gigantic wind up mechanisms that spin round and round until you're never really quite sure when they will release that yellow ball. I took far too many pictures of our girl, but to see her intensity and her skill was too much for me to pass up. 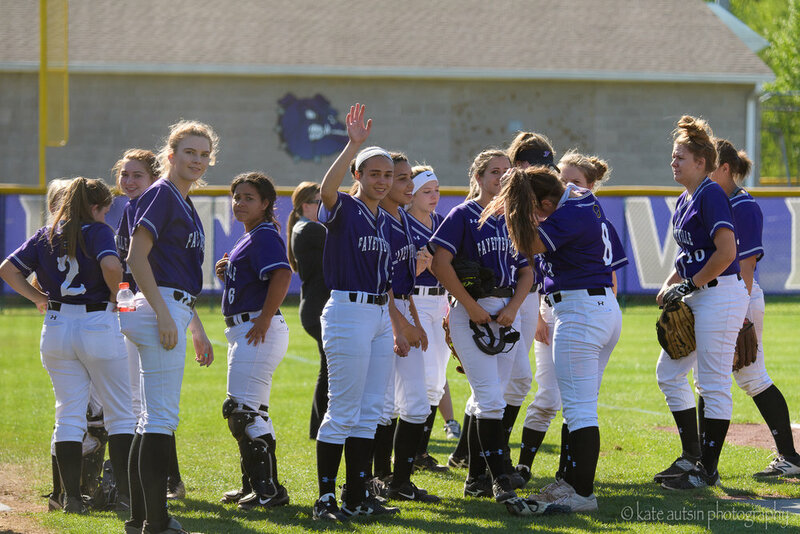 Our girls sadly wound up losing to Rogers, which nobody (at least in Fayetteville) likes to see. But The Girls of Spring have a few more games left in the season to redeem themselves and if they play as hard as they did during this particular game, I'm sure they will succeed. And I will try to be there as much as I can cheering them on.